Last weekend, on Saturday 25th February, the Art Gallery and Museum staff were invited to join Bedford Creative Arts artist Arabel Rosillo de Blas at her Conversations in Lace event at the Tourist Information Centre, which is part of the Lace in Place season. Deciding which pieces of Bedfordshire Lace to take out for display was quite tricky as there are so many beautiful pieces in the collection. Our largest collection of lace was donated by Amy Lester the Grand-daughter of Thomazin Lester in 1947. Thomazin was a lace dealer in Bedford from the early 1800’s, and his sons Thomas and Charles Lester continued his business until the turn of the twentieth century. Thomazin Lester (1791 - 1867), dealer in lace in Bedford from 1811 onwards, picture c.1860. The early Nineteenth Century pieces are influenced by lace design from Lille, France in a Point Ground (net like backing with decorative motifs) style and the sample books we have from Lester’s shop are all of this type from this period. Lester exhibited at the Great Exhibition in 1851 and won recognition for his lace designs. 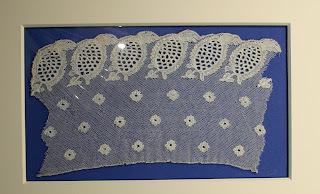 Maltese lace was also exhibited and influenced the development of Bedfordshire Maltese Lace, which was a much more openly worked plaited lace. 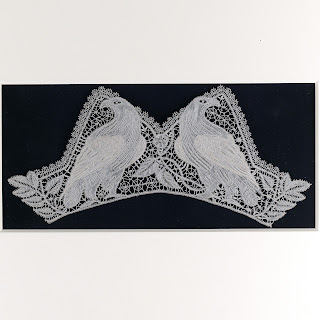 The Maltese style of lace had benefits over the point ground in being easier and less time consuming to make, it could compete more successfully against the machine-made lace being produced in Nottingham from the 1840’s and widening the sale of it to a mass market. Thomas Lester and his sons were able to keep their business going by adapting the design and style of the lace to meet current demand and trends in fashion, producing collars, cuffs, shawls and caps, then later parasol covers and fans. The industry, however, was greatly in decline toward the end of the Nineteenth Century and gradually lacemaking came to be kept up by just a small number of specialists. More recently it has survived through interest as a leisure time handicraft through groups, such as the Aragon Lacemakers who were set up in 1977, to try to preserve the craft for the future enjoyment of their members and the general public. Aragon Lacemakers take their name from Katherine of Aragon, the Spanish first wife of King Henry Eighth who, the story is told, whilst imprisoned at Ampthill castle during the early Sixteenth Century, would go to a summer house in the village and teach the villagers lace there. We took a selection of lace from the Lester Collection as you can see above, along with a few bobbins and prickings or lace patterns. 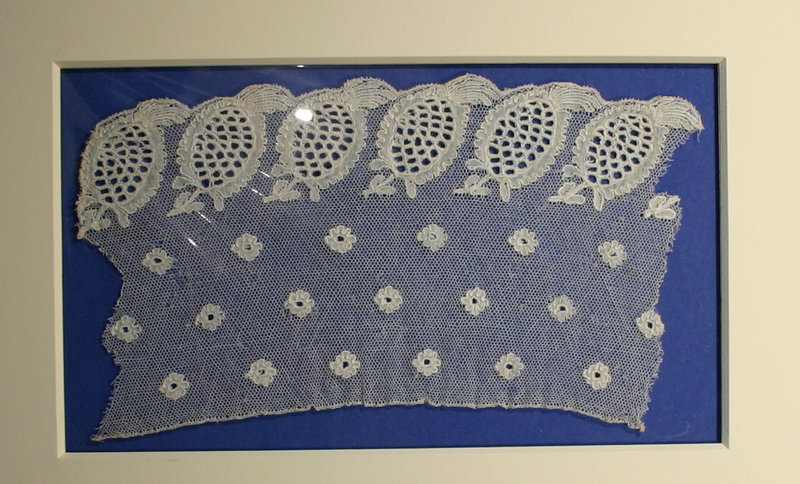 There was one example of point ground Lille style lace displayed to see the difference in style between this and the Bedfordshire Maltese lace designs. 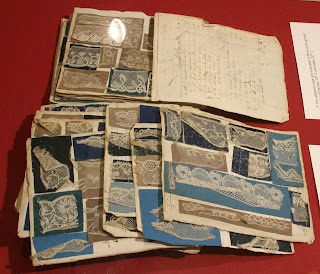 The display included examples of cuffs and collars in the Bedfordshire style, with the recognisable trail of the river and leaf designs in several of the pieces. One of my favourite pieces is the Lester Eagle design, which were produced possibly as a set with a collar, lappets and cuffs in the collection, and the detail of which is exquisite. Marilyn from the Aragon lacemakers also joined the event, bringing her own lace pillow and making lace with her fantastic antique bobbins. She had a wonderful selection of hanging bobbins, which were produced by traders as a ‘souvenir’ of the day, including those of William Bull (1871), William Worsley (1868) and Joseph Castle (1860), which we have examples of in the collection also. Marilyn also had a John Bunyan bobbin, which was created to celebrate the unveiling of the Bunyan statue in 1874. Marilyn from Aragon Lacemakers showing me (Lydia) her wonderful bobbin collection on her lace pillow. 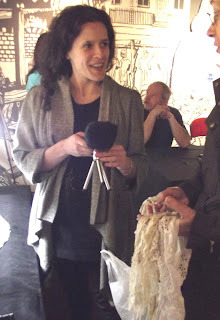 The purpose of the afternoon from Arabel's point of view was to invite the public to bring their own pieces of lace and share stories of what lace meant to them. We had a wide variety of visitors, many happy to talk about lace from countries where they had previously lived or travelled to. A few people brought lace in with them that had been handed down to them from family or made themselves. 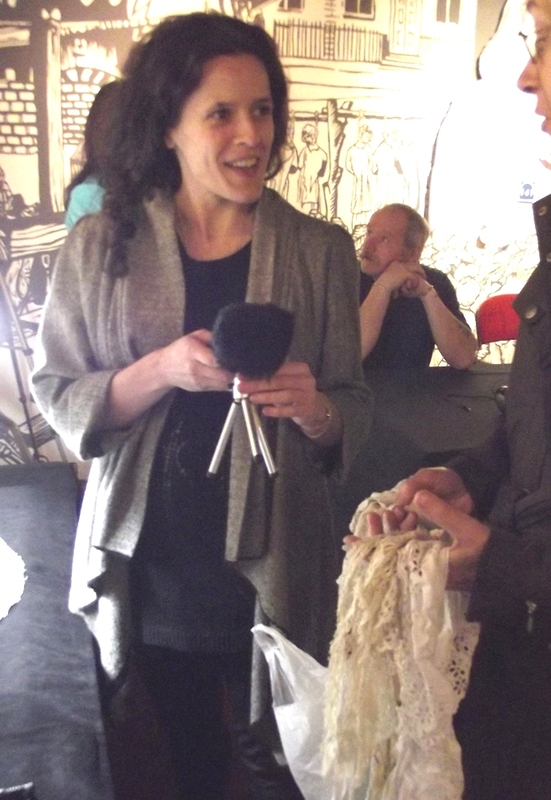 Arabel Rosillo de Blas, artist from Bedford Creative Arts talking to a member of the public about their lace. 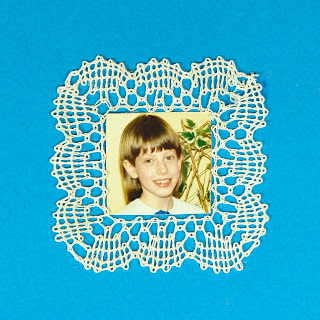 One younger Bedfordian, Tracey, remembered being taught lace at her school when she was eight and brought the fruits of her work to show us. She also impressed us all by taking up the practice lace pillow and making some lace on the day, saying that she was surprised how much it came back to her even though she had been just a child when she learnt and had not touched a bobbin since! 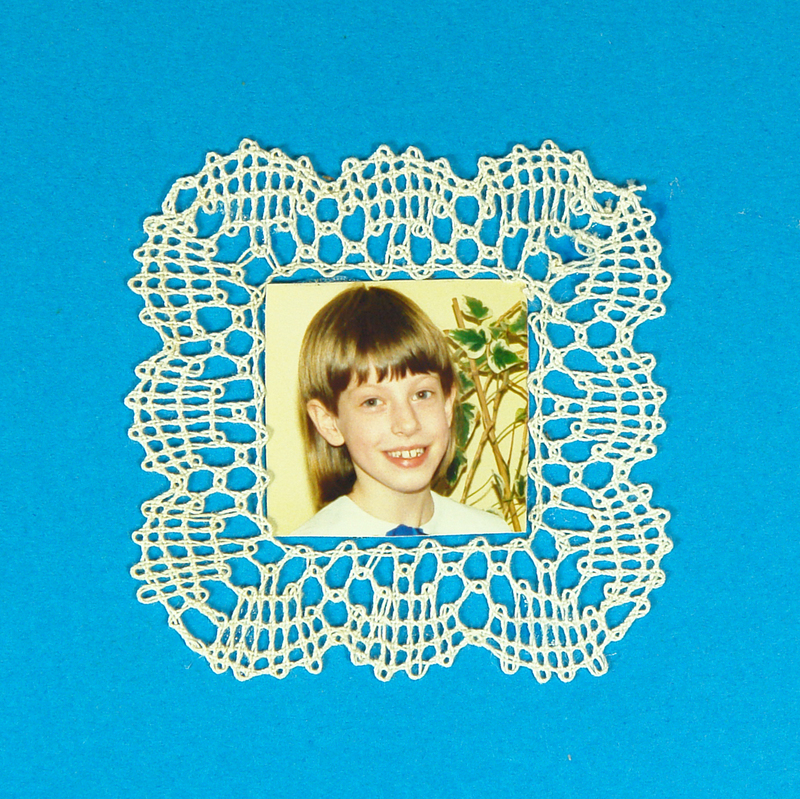 Tracey's Bedfordshire Lace made when she was eight years old. If you want to get involved in BCA's lace events then please visit their website for further details click here for BCA Events. The next event is the Large Lace at Bunyan Meeting Museum on 24th March 1pm, where you can become a human bobbin. Arabel's commission will be launched in early May and is proposing to decorate a building in St. Paul's Square with enlarged lace patterns - can't wait to see the finished work. Do get in touch with BCA if you have some lace that might be of interest to Arabel and a story that you think relevant to the project. If this blog has inspired you to get more involved with taking lacemaking up as a hobby, then you would be welcome to contact Marilyn, the Secretary of Aragon Lacemakers. The Aragon lacemakers also have their 25th Anniversary event at St. Paul's Church on the 25th April later in the spring. 2012 will be a great year for celebrating Bedfordshire's lace-making tradition. Thanks go to Arabel Rosillo de Blas, Lyndall Phelps (Project Manager for Lace in Place), Jennie Stoddart (Curator Producer, BCA), Marilyn Two and the Aragon Lacemakers, Gemma and Cathy for their assistance on the day.